​Andy Griffith is gone. It hurts the heart of every baby boomer. He was one of the last to go, after Barney Fife, Goober Pyle, and Aunt Bea. ​But, even in their absence, Mayberry lives on. Not because of reruns. Not because of Mayberry Days in Griffith’s home town of Mt. Airy, North Carolina. No, because it’s a place where people still do the right thing. ​When you find your fender dented and a note on your windshield, it’ll be a Mayberry number. When a dispute is settled over a cup of coffee and a wedge of pie instead of at the courthouse, Andy will be smiling. ​Corny? Sure. Old fashioned? You bet. Instead of antidepressants and fish oil pills, our best hope is a familiar tune whistled by a dad and his son on the way to the fishing hole. 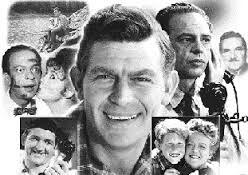 ​There’s no sure cure for what ails society, and Andy Griffith knew it. His formula was a bit of kindness and common sense. ​There’s a little of Turner’s Grade in everyone’s life. Knowing Andy was out there pulling for us made it easier. ​So long Andy. We’ll watch over things in town.